Sometimes you get exactly what you expect, and that’s the case with Little Evil, a Netflix original comedy that you can predict with ease. If you think you’re going to like it, you will. If you think you’re going to hate it, you will. It’s just that type of movie, a predictable and been-there-done-that story that you can see coming a mile away. I was prepared to enjoy it, at least a little, and I did, with very little effort on my part and, honestly, very little effort on the filmmakers’ part either. No one spent years developing this plot or these characters, no actors spent long night poring over the script. It is what is is, and in this case, that’s not so bad. Gary thinks he has found the perfect woman, a mate to grow old with. Samantha is beautiful, sweet, kind, honest; everything a man could want in a wife. She does come with one small parcel of baggage though, and that’s her son Lucas. He doesn’t talk much, he’s kinda creepy, and when he curses people at school they tend to kill themselves almost immediately. Gary suspects that Lucas might actually be a demon, and it turns out that he’s much worse; the antichrist. Now, what to do; kill him or stand by him, watch the world burn or try to save this new family, turn tail and run or man up and become the best step dad on Earth? It’s a ridiculous plot, it flies by, by the end you’ve had a couple laughs, and you completely forget the movie ever existed. Make up your own mind whether that’s something you’re interested in or not, but Little Evil is never trying to trick you, it’s always being honest about being dumb. 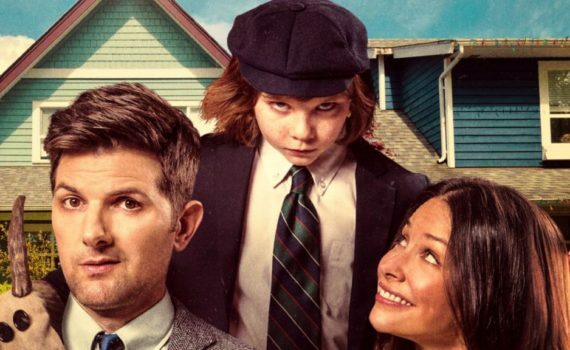 Scott is a solid dad in over his head, Lilly is actually really charming as Sam, and Atlas is pretty scary as a Damien who wants everyone to go straight to hell, literally. The side characters are funny, especially Bridget Everett, and I chuckled a few times throughout the 90 minutes. The end is bad, like they just gave up, and who can blame them; no one will ever talk about this movie again past this weekend, but it’s here for your random, partial enjoyment if you so desire.